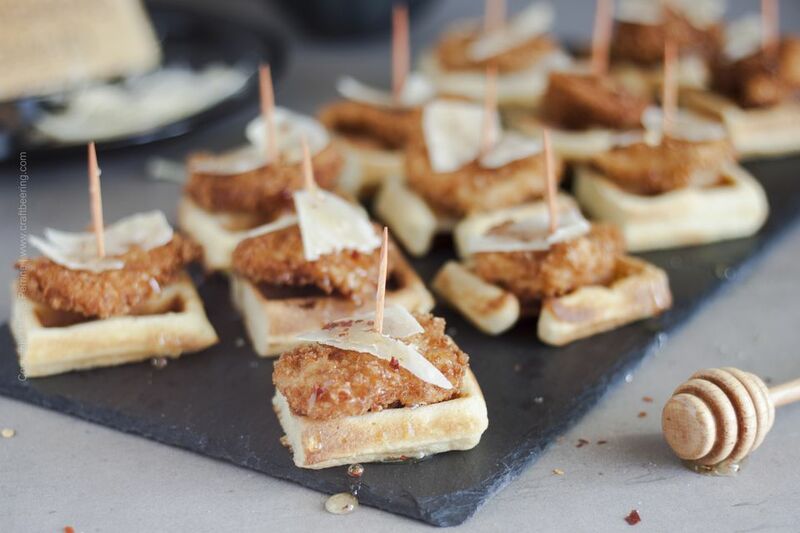 Mini chicken and waffles are excellent as a passed hors d'oeuvre, party appetizer, or a fun brunch buffet item. As a twist on the well-loved American dish of fried chicken served on top of a stack of waffles and flavored with hot sauce and maple syrup, this recipe is designed to satisfy comfort food cravings in a bit more elegant way. Buttermilk and Panko crusted chicken tenders are secured on top of small pieces of fluffy buttermilk waffles with toothpicks. Parmesan shavings add a touch of nutty depth and saltiness, and a generous drizzle of hot honey rounds off the flavors and introduces a spicy kick. If you cannot find prepared hot honey making your own is as easy as folding hot red pepper flakes into your favorite honey. With only a few simple ingredients, easy to follow steps, and the help of a waffle iron, even a kitchen novice can successfully tackle these delicious bites. The recipe for the waffles yields about a dozen regular-sized waffles. Cut into mini pieces only as many of them as you need and freeze the rest. Once frozen they are perfect for the toaster when you need a quick breakfast. It is absolutely acceptable to prepare the stacks of mini chicken and waffles in advance and to heat them up in the oven for a couple of minutes just before garnishing with Parmesan shavings and hot honey and serving them. Preheat the waffle iron according to the manufacturer's instructions and preheat the oven to 200 F.
In a large bowl mix together the dry ingredients for the waffles. In a small bowl beat the eggs, and stir in the melted butter, the buttermilk, and the vanilla extract. Add the wet ingredients to the dry ingredients and stir to combine. Do not use a mechanical mixer or over mix. Grease the waffle iron with your cooking spray or oil and using a measuring cup add the recommended amount of waffle mix to each slot (again, per the manufacturer's instructions, as each waffle maker may be able to handle a different amount of waffle batter). Cook until the waffles turn golden on both sides, then remove and cut them into small bite-sized pieces. Place them in the oven to keep warm until ready to serve. Repeat with the remaining batter. In a deep heavy-bottomed pan over medium-high heat bring the cooking oil to 375 F. Prepare a paper towel lined baking sheet for the fried chicken. While the oil is heating, slice the chicken breast into bite size pieces to roughly match the size of the mini waffles. Prepare three bowls - one with flour, one with buttermilk, and one with Panko bread crumbs. Coat each piece of chicken in flour (shake of excess), then buttermilk, and finally in Panko. Fry in small batches for 6 to 8 minutes. Place on the paper towel-lined baking sheet. Assemble the mini chicken and waffles onto a serving platter by securing the chicken pieces onto the waffles with toothpicks. Using a potato peeler, shave off Parmesan bits and garnish. Drizzle with hot honey and serve.